It’s interesting – I’ve never been one to crochet clothing and when I do, I hardly ever wear what I make. I’m really not sure why, I guess it’s just not my jam. When it comes to knitting, it seems that I am drawn to clothing. I enjoy knitting sweaters and wearing them proudly! Any time you take on a project like a sweater, it feels like you’re walking into a dark and creepy hallway. There are so many doubts and what ifs – at least that’s how it was for me. Once I put my knitting fears aside and just tried it I found out that knitting sweaters is so much fun! I’m going to be honest here – knitting sweaters is not as easy as knitting a scarf. However, I will be here holding your hand through the entire process! We need practice and we need gratification. Making a sweater for yourself could take weeks. You’ll feel like your knitting your little heart out and getting no where. BUT – when you knit a baby sweater, you can have it done in a weekend. You’ll get the nearly instant gratification you need to convince yourself that you like this new style of project. Make sense? That’s why our first clothing venture here on B.hooked Knitting is the Year Round Baby Cardigan by Red Heart. The pattern is completely free and I’ve filmed a tutorial (well two tutorials) to walk you through the entire project. From start to finish. What you see here is a gorgeous design by Red Heart, the Year Round Baby Cardigan. By knitting this pattern, you will get the experience of finishing a sweater and the confidence you need to move on to the next. I spent between 25 and 28 hours knitting my year round baby cardigan. This pattern calls for the lightweight version of baby hugs, so the growth is slow but steady. Small investment if you think of the heirloom I’ve created. Totally worth it in my book. This is a great first time knit sweater – even for a beginner. 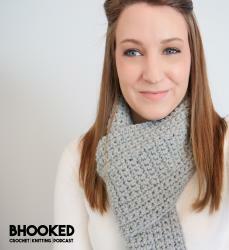 It utilizes the knit stitch throughout the majority of the pattern and a few purls at the neck line and bands. If you know how to work these two stitches and have a good sense of tension, I’m quite confident that you will be successful. I know many of you struggle with written patterns. I’m working on additional resources to help you through this struggle but until those are ready, you’ll want to stick with patterns that I have created a video tutorial for. This pattern is no exception. The written instructions are three pages long and if you already struggle with patterns, it might scare you off. I don’t want that to happen because this sweater is doable! Disclosure: Please note that the links below are affiliate links, and at no additional cost to you, I will earn a small commission if you decide to purchase your supplies online. Please understand that I have experience with these products and I recommend them because they are optimal for this pattern, not because of the small commissions I make if you decide to buy them online. If you have received valuable information from me at any point, this is one easy way to pay it forward and say thank you for a job well done! I hope you have as much fun making your sweater as I did. I can’t even explain how much joy I felt through the process. It’s one thing to knit a hat or a scarf but knitting a sweater is a complete game changer. I plan on making even more clothing throughout the year. If you have fun with this project, keep an eye out for more clothing tutorials this year. One thing I want to leave you with is this – I’m here for you. I’m not the kind of instructor that provides a resource and never comes back to it. You are my students and I’m here to help you through the process no matter when you are reading this post. If you find yourself stuck at any point, please leave a comment and I will do my best to help you through it!